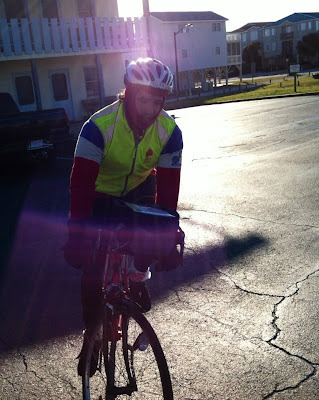 Early Saturday morning I lined up for the start of the BFL 600k in Lumberton, NC. The forecast was looking ugly- light rain Saturday, overnight temperatures in the 20's, and gale force winds. I've ridden in rough conditions before, so that didn't deter me. I'd had a rough time at the 300k two weeks earlier, suffering from knee pain in the hills, but I hoped that I'd recovered enough. I felt good at the start, staying with a good sized group and making good time. Met some new friends from Ohio- apparently our forecast was much more favorable than theirs! I did one short pull on the front and started to feel the familiar twinges in my right knee, so I went back to the back to draft and spin. Problem with the back of the group is the accordion effect- the cumulative effect of lots of little accelerations just to stay with the group can cause as much damage as sitting out in the wind. I decided to get on Tim's wheel, he's nice and steady. That worked for a little while, but eventually Tim got tired of our slow pace and went to the front to pull. I stuck with the new fast pace for awhile, but it became obvious it was too much for me. The knee pain was back in full force, and we weren't even to the first control yet. I dropped of the back to spin my own tempo. After the first control I rode by myself and was feeling better, but I think the damage was done. 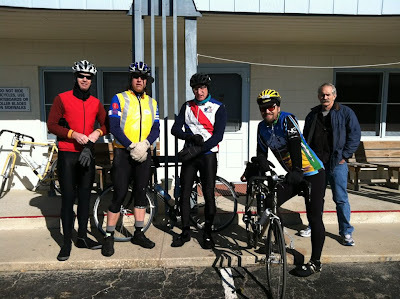 Another group came by with Mike D, Cap'n Ende, and Mark T. They asked me to jump on, but I needed to spin my own pace. I hate that they think I'm being anti-social, but all the work I have to do to keep up with these groups tends to hurt me and slow me down even more. I saw them again when I stopped for lunch at Andy's. The two groups had merged into one and I tried to leave with them, but they took off down the road while I waited for oncoming traffic and I didn't feel like hurting myself even more to try to catch them. I assumed I wouldn't see any of them again. During the next stretch my right knee got much worse. Since I'd been compensating by working harder with my left I started developing pain in that knee as well. By the time I reached the control at Rocky Point, roughly 200k in I was seriously doubting the wisdom of continuing another 400k. The wind was really picking up and I was running the risk of seriously injuring myself if I pushed through the knee pain. I stopped for dinner and called my wife to talk it over. 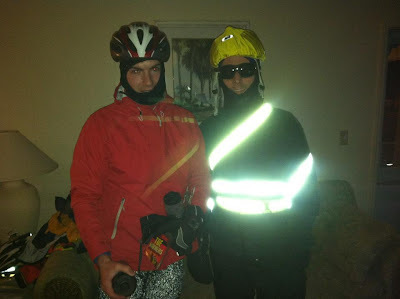 She was unable to talk sense into me, so I prepared for night riding. I had plenty of time to make it to the next control, so I planned to just keep spinning as easy as possible. If I made it 65 miles to Garland I'd get a bit of tailwind. The wind got worse, and along with it so did the pain in my knees. After an hour or so I was pretty sure I'd made the wrong decision in continuing. My left knee occasionally popped, and I could no longer stand up in the pedals. I pulled a toestrap out of my bag and cinched it up underneath my left kneecap for some support. It helped a bit. Sometime during this stretch I was surprised when I was passed by the paceline again! How did I get in front of them?!? I pushed harder than I should and caught on the back, where I found out that Mark T had crashed and tacoed a wheel. They waited about an hour for Tony to bring a replacement. Apparently they yelled when I passed by, but in the wind and traffic I never heard them. I stuck with them for a short time, but it was killing me. After a stop sign they pulled away and I couldn't close the gap. Ian H fell back and wanted to pace me back up, but I was cooked. I wish I'd heard them yelling when they had Tony out, I would've piled into his truck and bagged the ride right there. Nothing to do now but soldier on. I've never ridden in worse headwinds. It was gusting, so just as I'd manage to spin up and get rolling a huge gust would come along and nearly stop me in my tracks. I've since found out that we experienced true gale-force winds, with gusts up to 45mph!! Occasionally a gust would hit from the side and nearly knock me off the road. I'm pretty sure in about an hour and 15 minutes I traveled only 6 miles. During this stretch I remembered my #1 goal for this year is to have fun on every ride. This ride had ceased being fun, and now had become dangerous. 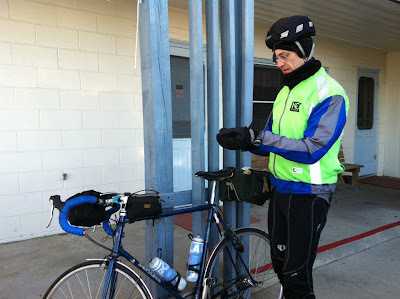 Every pedal stroke could be worsening my knee injuries, and I couldn't push hard enough to generate heat and stay warm. I decided to abandon, and stopped to call Tony. Zero cell coverage! I rode on a bit and spotted a closed convenience store, stopped and tried to call again. I got only enough signal for it to ring once or twice, then got dropped again. I had to get going again. After awhile I was surprised to see someone putting a bike into the trunk of a car. It was Bob from Ohio- he'd been dropped by the group and become so cold he couldn't shift gears anymore. He was shivering uncontrollably and slurring his speech. He'd started knocking on people's doors, looking for help and after a few houses wouldn't open their doors he found a nice local guy who agreed to drive him and his bike to Garland. Seeing him in what looked like a state of mild hypothermia, out in the middle of nowhere with no cell service really drove home the situation I was in. I didn't even hesitate to ask if I could ride along, and we stuffed my bike in the trunk as well. It was nearly 10 more miles before I could get a signal to call Tony, and he made arrangements for Mary F. to come pick us up and take us back to Lumberton. 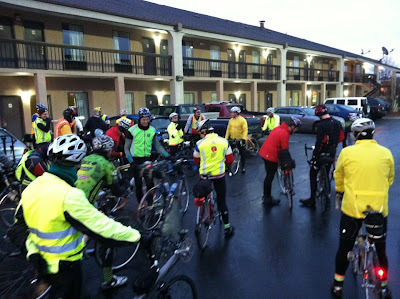 I got a couple of hours of sleep in the common hotel room in Lumberton, then got up and volunteered to help Tony support the riders who were still out there. We went and got snacks and drinks and I drove them down to Sunset Beach. The two guys up front had arrived there during the night to find that Tony hadn't had a chance to stock up the control since he'd been called out on course to help quite a few riders. 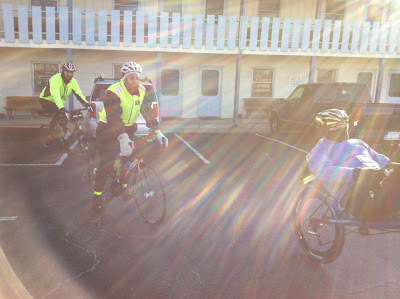 I helped get them fueled up and on their way, then greeted the other riders as they came in. Once everyone made it through I took all the drop bags back to Lumberton and then headed home to ice my knees. I've always known I'd eventually have to abandon one of these rides, I was just hoping it would be a good story and not just something like a crash or a mechanical problem. I think this qualifies. I don't regret starting the ride, though I knew the forecast and my physical limitations. I do think I need to take more time off the bike and let my knees heal. In my opinion ... it makes a nice story, and is well-written (which is not necessarily the same thing). Welcome to Club Randonnee' Abandonnee'! Glad you survived and may your knees recover fully. Sounds like it got really tough out there once the cloud cover disappeared and the wind picked up. I just did the 200 and the last 40 miles was enough of a challenge. I'm sorry you didn't finish, but I'm glad you had good sense (in the end) and got a good story. While your standard of what constitutes a fun, long ride differs from mine by an order of magnitude, we have the same standard for a bike ride. When it stops being fun, stop. I've stopped once. 30F with a 30mph headwind. Made 5 miles in 1/2 an hour. Fingers and toes hurt from the cold. I said, "Nope, I refuse to ride the last leg in these conditions. SAG can come and get me." Brian, I hope your knees heel well. Mine hurt on this ride last year. I checked my measurements when I got home and found a seat post 1 inch too short. I felt like a fool. Thanks for helping out. I wish you would have heard us at the Sausage Outlet. We yelled at the top of our lungs but it was no use with the wind. Have you heard from Bob? I hope he is fine. Not just the trunk of any car. A Cutlass Supreme, was it not? Nice to see you again on the road. Take care of the knees.